You are here: Home / News / Uncategorized / Gutter Cleaning – What NOT To Do. Gutter Cleaning Tips From The Pros. Don’t Squat On Your Roof: To safely clean your own gutters, you need a tall enough ladder to access multiple points on your roofline. Once you have the appropriate ladder, always clean your gutters from the ladder as opposed to squatting on top of your roof and reaching down into the gutter. This might sound like common sense, but the constant shifting of the ladder down the gutter line leads many a homeowner to get on the roof to clean the gutters. Don’t Use Bare Hands: All types of dirt, debris, and critters can take up residence in your gutters. Wearing gloves protects your hands from the nastier elements of decomposition and stagnant water. Don’t Flush Your Gutters: While flushing the leaves and dirt down the downspout might sound like a good idea, don’t bother. A clogged downspout is much harder to clean and could result in costly expenses to remove dense leaves or even animals. Clean your gutters first, and then flush them to make sure they are working properly. Don’t Do It Yourself: Are you sure you want to do this yourself? Your safety or the safety of your loved ones is more important than the cost of hiring a professional to clean your gutters. Additionally, the cost of a ladder tall enough to hit multiple peaks will pay for a full year of gutter cleaning. When you hire Valley Roofing, we’ll inspect your roof for any damage while we’re up there. Scheduling Your Gutter Cleaning Is Easy With Valley Roofing. 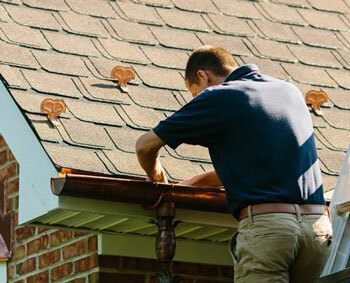 Valley Roofing has professionals experienced and quick at cleaning your gutters. Get a free estimate and schedule cleaning around your schedule. Interested in options to minimize gutter maintenance? We supply and install gutter guards to minimize twice a year cleanings down to once every five years. Contact a member of our team to learn more. Are You Ready To Get A Free Estimate On Gutter Cleaning? Why Metal Roofing Is A Top Design Trend For 2018. The Latest Sunroom Design Trends!